Item1991.028 item 211 - Part of Business Section, Brampton, Ont. Item1991.028 item 212 - Business Centre, Brampton, Ont. Item 1991.028 item 208 - On Wellington St. Brampton, Ont. On Wellington St. Brampton, Ont. 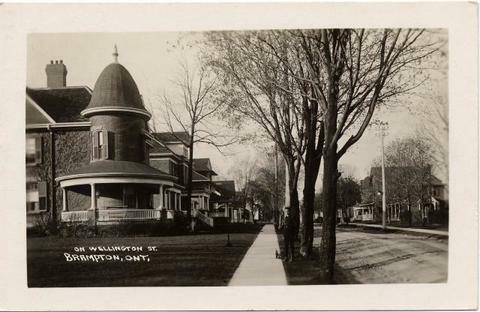 Item consists of a real photo postcard of houses on Wellington Street East, as viewed from Chapel Street.